Present state: Demolished - two sidings for Bounds Green traction maintenance depot run into the north end of the station site although the remaining sections of platform are now only earth mounds. Housing stands on the rest of the station site. A small railway building stands at the entrance to the former goods yard. Notes: Palace Gates was a fine looking station, built of red brick, and built as a through station with two platforms, each of which measured 750 feet. These were linked at the north end by an imposing glazed footbridge, supported by brick towers, which boasted the luxury of fireplaces to keep the structure warm in winter. The station buildings were very substantial and each platform was covered by 260 feet of awning. it was hemmed in by housing. Another means of access led onto the down side, but this was less impressive. 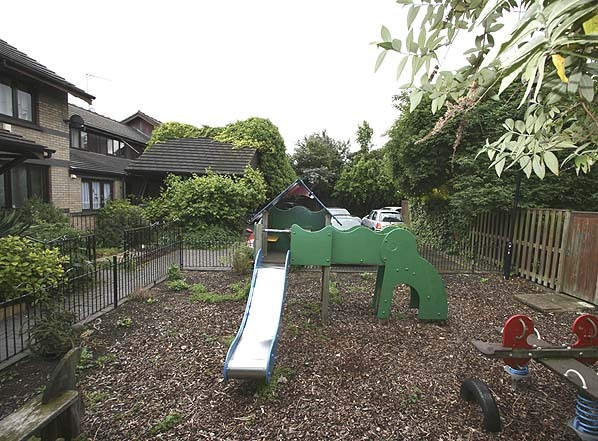 It adjoined the present Dorset Road, from which it was separated by a small forecourt. A signal box was situated on the London end of the down platform and contained a frame with thirty levers. Beyond the station, the tracks continued to serve a goods yard, carriage siding and locomotive depot. The latter of which was sited to the east of the line, and included a two-road brick-built shed. There were also watering and coaling facilities, together with a turntable, which measured 45 feet 9 inches. This may have seemed an unnecessary luxury on a line primarily worked by tank engines. 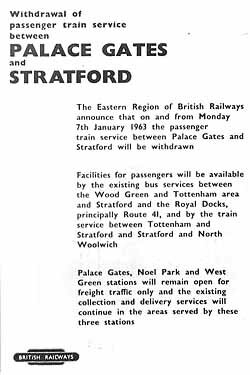 Palace Gates depot, which was actually a sub-shed of Stratford, had a staff of over thirty, and an allocation of ten locomotives. goods traffic until 5th October 1964 although private sidings serving the Coal Concentration Depot that had opened in July 1958 remained in use. 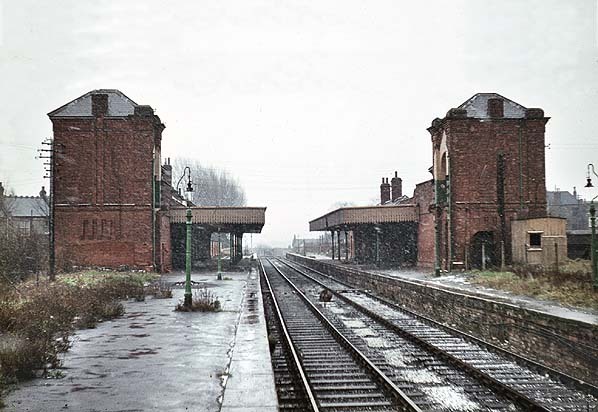 The footbridge and signalbox demolished in c.early 1968 and the buildings were demolished by 1974 leaving just the platforms and track intact. 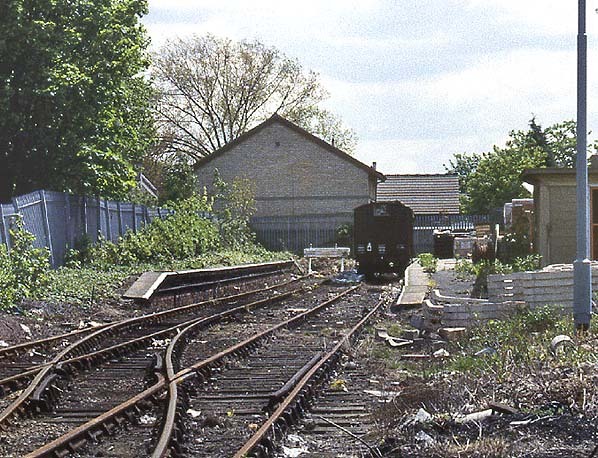 The loco shed was demolished in 1971 and the site is now occupied by Bounds Green traction maintenance depot with two siding running through the platforms. 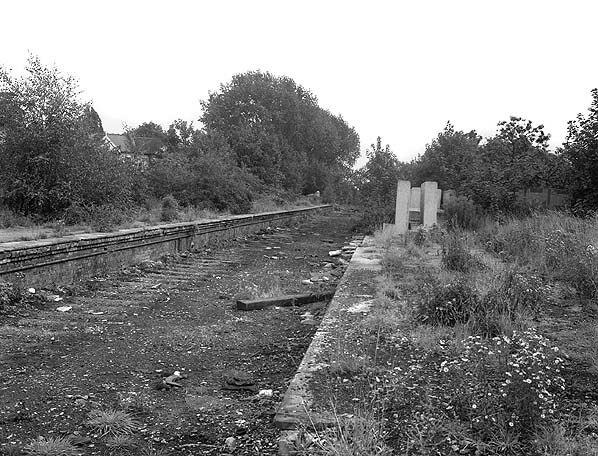 The track was eventually cut back to the north end of the station where two short sections of platform remain today but now much degraded after the edge stones were removed in 1999. The bulk of the station site has been redeveloped for housing but a small single-storey building survives at the entrance to the former goods yard. Park to Highgate which received parliamentary approval in 1864. No work was undertaken and the line was abandoned in 1869 due to cost and the steep gradient up to the Palace site. The west end of the line between Highgate and Muswell Hill was built by the GNR, opening in 1873 with an extension to Alexandra Palace opened by the Muswell Hill & Palace Railway on the same day. The Palace, which also opened on the same day as the railway was an immediate success but this was short lived as it was gutted by fire 17 days later, reopening in May 1875. In an attempt to capitalise on the popularity of the Palace as a tourist attraction the Great Eastern resurrected their line from Seven Sisters but this time it was a more modest scheme, terminating at a station called Palace Gates adjacent to the GNR's Wood Green station and avoiding the steep climb up to the Palace. Passengers wanting to reach the Palace faced a steep 3/4 mile walk from the new terminus. 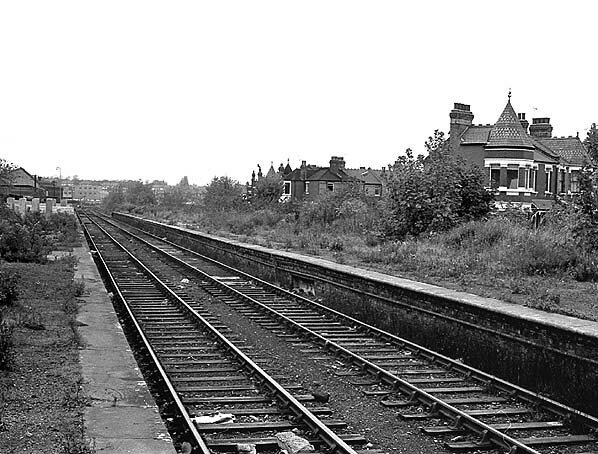 Parliamentary approval was received in 1874 and construction of the 2 1/2 mile double track branch started almost immediately with intermediate stations at West Green and Green Lanes. The line opened between Seven Sisters and Green Lanes on 1st January 1878 with the final section to Palace Gates opening on 7th October 1878. Initially services ran from Liverpool Street but from January 1880 trains also ran to Stratford and Fenchurch Street using a new junction at South Tottenham. From 1st September 1880 this service was diverted to Blackwall via the 'Limehouse Curve' but this service was not well used and was withdrawn a few months later. From 1st June 1887 a new service to North Woolwich was introduced which was to remain through the line's life. Alexandra Palace never lived up to expectations as a tourist attraction. Tourist traffic on the branch never amounted to much except on special occasions such as bank holidays and exhibitions. The line relied on commuter traffic to the City and the East London docks. The Palace Gates branch was at its height in the early 20th century with a 30-minute interval off-peak service to Liverpool Street (more during peak hours) with 41 up and 38 down trains between Palace Gates and Liverpool Street and an hourly weekday service to North Woolwich (less frequent on Sundays). Passenger numbers were soon in decline however due to a change in employment patterns (local road journeys to new factories instead of radial rail journeys) and improved road transport as tramways spread northwards, reaching Wood Green from Finsbury Park in 1904. Local bus services were also improved and it was soon quicker to reach central London by road. In 1912 the Sunday service into Liverpool Street was withdrawn and replaced by a shuttle between Seven Sisters and Palace Gates. Although fewer people now used the line to reach central London it still provided a useful commuter service to the East London Docks and during WW1 it was used by munitions workers commuting to the Woolwich Arsenal. From 12th July 1920, the Great Eastern introduced a new intensive suburban timetable which revolutionised workings in and out of Liverpool Street. To aid easy identification of trains by passengers, and therefore avoid congestion around the barriers, all rolling stock became colour coded. First and second class compartments were denoted by yellow and blue bands respectively, and a coloured board was also attached to the sides of the guard’s van to identify the train’s ultimate destination. In the case of through workings to Palace Gates this was pink. The garish collection of hues soon brought the nickname ‘The Jazz Service’. 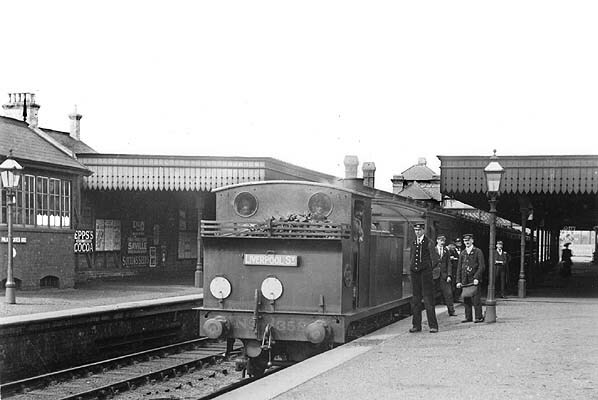 The new timetable also brought new rolling stock with the introduction of 2-car 'auto' or push-pull sets which provided the half hourly slack period working and at peak hours connected with Enfield line trains at Seven Sisters, alternating with through trains between Palace Gates and Liverpool Street making a combined 10-minute frequency. Although the track north of Palace Gates station terminated very close to the Great Northern line there was no physical connection until 1929. Even then there was only a single line used almost entirely for stock movements from the Great Eastern Section to the carriage washing plant at Bounds Green, although it also saw a few excursion workings towards the end of the 1930s. After the first war passenger numbers continued to decline not helped by the opening of the Piccadilly Line from Finsbury Park to Arnos Grove on 19th September 1932. New tube stations at Turnpike Lane, Wood Green and Bounds Green all took passengers from the Palace Gates branch. Liverpool Street supplementing the shuttles and the North Woolwich service. After the war passenger numbers on the remaining North Woolwich service declined rapidly and this was soon reduced to a peak-hour-only Monday - Friday service with a very limited weekend service of one morning and one afternoon train. There was however little demand for this weekend service and it was soon withdrawn. The shuttle service was surprisingly reinstated in May 1948 but discontinued again in January 1951 due to shortages of fuel. The peak hour North Woolwich service continued through the 1950's with the occasional excursion to Southend or Clacton using the branch. 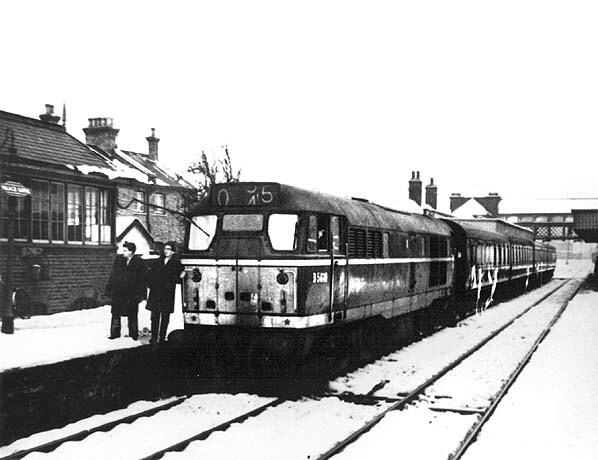 In May 1959 the 1944 connection was to prove useful once more when engineering work at Broxbourne meant that Cambridge trains were diverted along the branch. The locomotive depot at Palace Gates closed in June 1954 although by this date it was run-down and the turntable had been out of use for some time. came as no surprise when closure was eventually announced for 5th January 1963 with the last train consisting of four coaches packed with mainly enthusiasts hauled by Brush Type 2 Alma-Ata diesel loco. The train returned to Stratford empty. Freight services carried on for a littler longer with the goods yards at Noel Park and Palace Gates closing on 5th October 1964 while that at West Green closed on 7th December 1964. Through freight traffic ceased on 28th December 1964. 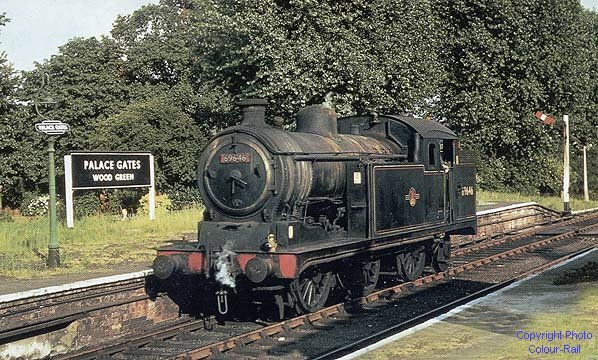 Since July 1958, there had been a coal concentration depot in the sidings at Palace Gates and this remained in use, although it was reached by way of the connection with the former GNR at Bounds Green. The track was lifted in 1966 and today although some sections of the track bed have been developed the track is for much of its course traceable and a number of overbridges remain extant. All the station sites have been redeveloped with the exception of the north end of Palace Gates and Seven Sisters which is now a public park. 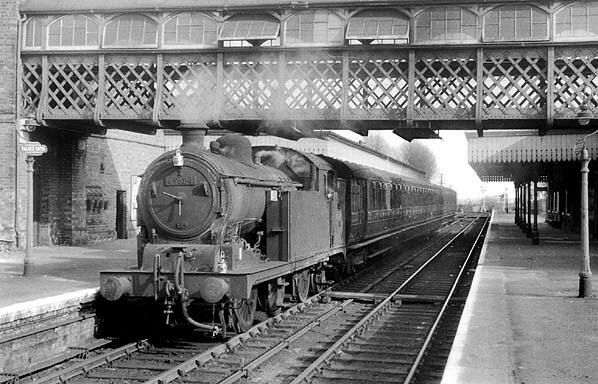 Palace Gates Station on 5th January 1963, the last day of public service. 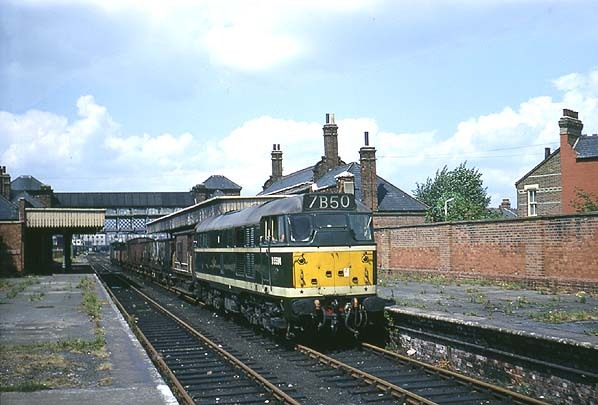 The loco is a Class 31/1 D5619. Palace Gates Station looking south east in May 1981, shortly after the track was lifted. The site of Palace Gates Station looking south east in May 2009. The remaining sidings at the north end of the station site are on the other side of a brick wall immediately behind the photographer.